An Bang beach in Hoi An and Bai Dai (Long Beach) in Phu Quoc were placed 86th and 93rd on the list of the 100 best beaches in the world, as announced recently by CNN Travel News. 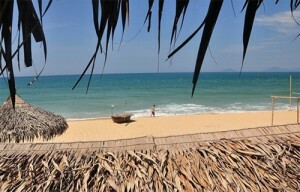 “Phu Quoc is fast becoming Vietnam’s most popular new island destination,” it reported. Visitors to the island can learn about its traditional local trades, including making fish sauce, planting peppers and breeding oysters for pearls. Located in the western part of the island, Bai Dai has a 15km long beach with crystal clear water. It was also introduced by Australia’s ABC News in 2008 as one of the most beautiful, cleanest and unspoiled beaches in the world. An Bang, which lies 3km away from the famous ancient town of Hoi An, is described as having “gentle waves and soft, white sand”. Its “Western-managed bars and restaurants” as well as its “specialized Viet cuisine restaurants” attract large numbers of foreign tourists. In 2001, it was among the top 50 beaches in the world as selected by CNN Go.